New Amsterdam delivered another fantastic, politically charged episode this week. One that begins with a somber tone. The doctors sit together in one of the conference rooms of the hospital, each one looking glum and blaming themselves for something different. For what, we don’t know yet know. Max soon arrives and holds a newspaper aloft, the headline is about a senseless death at New Amsterdam. From that moment alone, we already know one of the patients of the week is going to die by the end of this episode. Having watched many medical dramas prior to this one, and often concurrently given I’m also watching a few airing this fall, the set up and premise of this episode was nothing new to me. The Resident did something similar just last week actually and I’m pretty sure Grey’s has done it more than once. Something bad happened at the hospital and now we’re going to rewind and figure out what that was. That isn’t a criticism by the way, I actually like this particular trope, it’s like a mystery. So who were our possibly death candidates this week? A young black boy becomes the latest victim of police brutality as he gets the brunt of a gunshot that also injures another kid who was nearby at the time. One bullet gravely endangers the lives of two non-white children. The moment the kids arrive in the ER trailed by two police officers, I already knew they were going to address cop shootings and I was curious to see how the show would handle it. They did a fairly good job with it, the most poignant moments coming from other black doctors at the hospital like Floyd, Helen, and Malik’s mother. However, I’ve noticed a trend with this show where they like to brush up against particularly charged topics like police brutality, interracial dating, or the wage and hiring gap between white men and women and women of color, but then that’s all that comes of it, a brief moment never to be touched on again. While it was nice to have characters acknowledge the epidemic in our country it seems like the writing can’t make up its mind as to whether or not they want to go all in or just skim the surface and with subjects like these I think it’s very hard to tread that line and eventually they have to dive in one way or the other. Malik’s injuries are severe and when blood starts filling in around his heart, Lauren is forced to perform a procedure against protocol because the entire cardio-thoracic team is wrapped up in surgeries of their own. If she waits for someone to be available, Malik will die. Blood spurts out of the needle and Floyd immediately assumes that Lauren has made an error, “You better hope I can fix this,” he tells her ominously before getting Malik into surgery. It turns out later on, that Lauren actually did perform the procedure correctly, there were extenuating factors that caused the surge of blood flow and it was not her fault. Malik is stabilized and survives. I assumed he would as the case with these type of episodes is the patient that dies is rarely the one you most expect. While Malik made it out unscathed, Lauren and Floyd’s strange relationship is rockier than ever. He doubted her and she’s upset, even though he eventually concedes she did the right thing. I am not really sure what’s going on between the two of them and I don’t know that the writers are either. They’ve had so little development or scenes together that I get confused trying to understand where their mindset is and I think it would be a service to both characters to scratch the romance or at least put it on the back burner for a while until it can be revisited with a more straightforward plot in mind. Malik’s aunt winds up under the careful watch of Iggy. She has been his guardian ever since his parents died and the stress has chipped away at her emotional and mental health for years. Iggy diagnoses her with PTSD and I thought the scenes between them were really well done and emotional. Especially as she realizes that anyone can suffer from a form of PTSD, her line about thinking getting no sleep and being depressed all the time “is just part of life” broke my heart. Also in regards to Iggy, we get the reveal that he is gay/bi and happily married to a man with a few adopted children! I’m always happy to see more inclusion and LGBT representation in any show. And I think next week we’ll actually get to meet Iggy’s family so I’m looking forward to that. As for family affairs, Vijay has the long-awaited reunion with his son and it doesn’t go well. His first assumption is that his son needs money, which clues us in the nature of their past relationship. Apparently he has a sponsor so we can assume he is an addict of some kind. He claims he’s doing better now and manages a restaurant of his own. His sponsor told him to have no expectations of Vijay but he’s clearly frustrated by Vijay’s assumptions, shortness, and unwillingness to open up. Their meeting ends in an argument but we can see Vijay looking on forlornly as he passes his son’s restaurant at the end of the episode. It’s going to be a difficult journey for the two of them to get to a good place again. Segwaying back to patients, so if Malik didn’t die, who did? Well if you recall, two boys were struck by that bullet and the second, Jalen, had less severe injuries but ultimately ends up succumbing after surgery. His brother had come in to visit him earlier and went into a rage about being denied access to seeing Jalen. This wound up resulting in a violent altercation with the cops in the hospital and poor Max who caught an elbow to the face in the midst of the scuffle. But we all know by now Max is the most understanding guy around and is there for Javier all the way through the awful ending where he is actually told his brother is okay, only to watch him crash and die right in front of him. These writers just love making us cry don’t they? So we find out the meeting we saw at the beginning of the episode was actually not as negative as it looked. The article was propositioned by Max, he handpicked a journalist to follow him throughout the hospital to find the real story of New Amsterdam and while the headline may sound like a damning one, on the contrary, it was a positive one, painting all of the doctors in high esteem. - We also discovered this week that Helen wants a baby but may struggle to conceive because she is over the age of 35 and her doctor tells her that her eggs are not all that viable, she doesn’t have that many. Ugh, poor Helen. I wanted to give her a hug so badly during that scene! And while I do feel like the baby thing kind of came out of nowhere, if it means she’s going to get more of a story-line I’m all for it. It is also due to Helen’s fast thinking and steroid discovery leads to the team being able to save Malik’s life. - THE MAX AND HELEN HUG AT THE END! They are so sweet. I just love them so much. - When is Max going to start his cancer treatment? And tell Georgia? Also I did laugh when Lauren asked why he sounded like a frog. 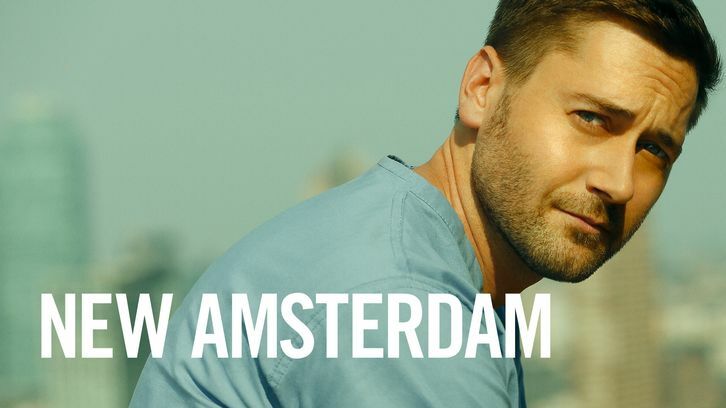 A NEW EPISODE OF NEW AMSTERDAM PREMIERES TUESDAY, OCT. 30 @ 10:00 PM ET/PT ON NBC.